Jan van Eyck (c 1390–1441), Three Marys at the Tomb (detail) (c 1425-1441), oil on oak panel, 71.5 x 90 cm, Museum Boijmans Van Beuningen, Rotterdam, The Netherlands. Wikimedia Commons. The last of these is often forgotten, but without a means to dilute oil paint, clean brushes and other painting tools, and remove wet paint, painting on any scale becomes very difficult. 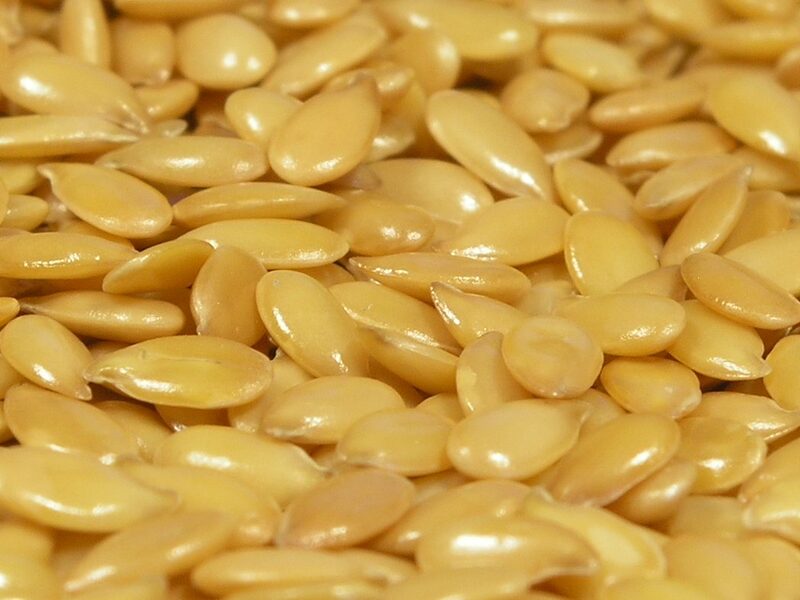 The most widely used drying oil in European painting is, and long has been, linseed, made by extracting the oil from the seed of the common flax plant. White and Plahter consider that linseed oil became established as the drying oil of choice in northern European painting by about 1250. Safflower, poppyseed, and walnut oils have also been used in European practice, and perilla, soya bean, and tung oils outside Europe. Safflower has been recorded in use for dyeing of ancient Egyptian textiles, but only seems to have become popular for oil extraction about fifty years ago. Extraction and use are broadly similar to flax and linseed oil. Poppyseed has a very long history, and it has been claimed that it was used in paintings in Afghanistan in about 650 CE, but its subsequent use is uncertain. Walnut oil is obtained from the nuts of the walnut tree, which was spread throughout Europe in Roman times, but is produced in relatively lower quantities unless cultivated. 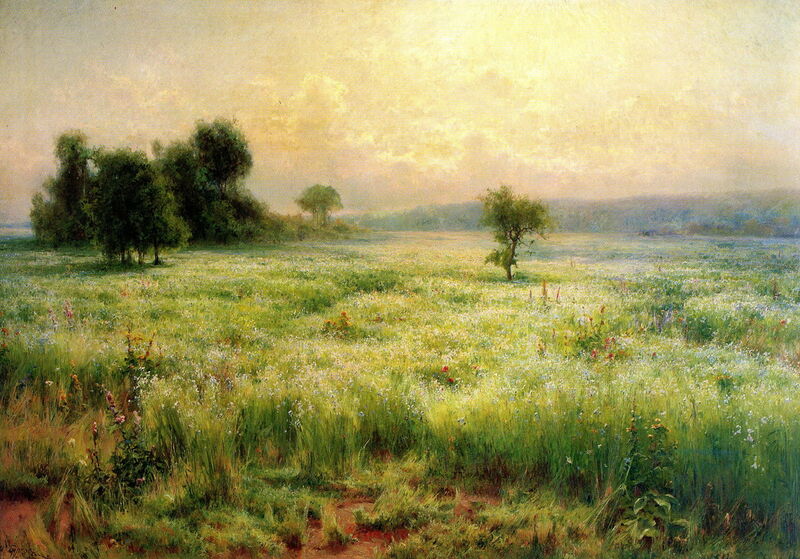 Mykhaylo Berkos (1861–1919), Flax Blooms (1893), oil on canvas, 126 × 198.5 cm, Kharkiv Art Museum, Kharkiv, Ukraine. Wikimedia Commons. 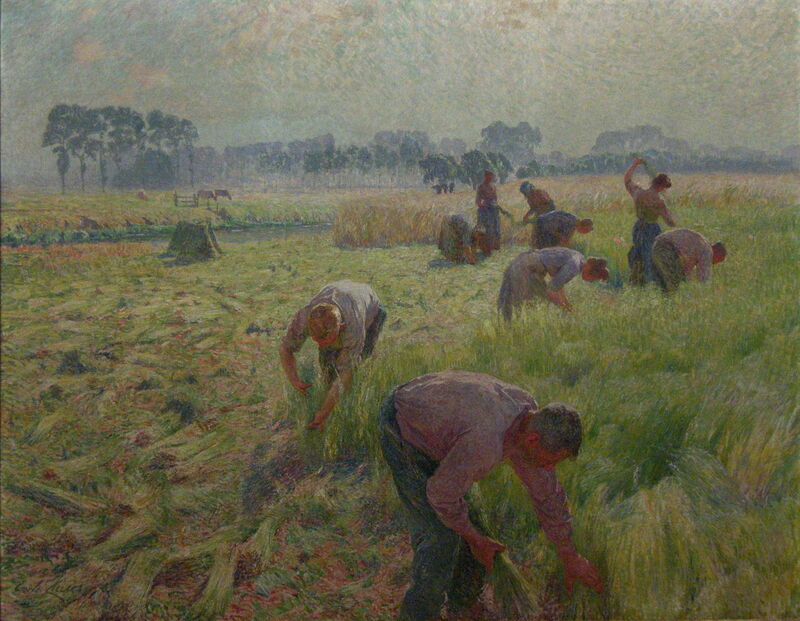 Emile Claus (1849–1924), Flax harvesting (1904), oil on canvas, dimensions not known, Koninklijke Musea voor Schone Kunsten van België, Brussels. Wikimedia Commons. The common flax appears to have been first domesticated in the Middle East, and has spread steadily across Europe, reaching northern Europe around five thousand years ago. Unlike the other sources of drying oils, it prospers in the cool and wetter climates of northern Europe. It has been used widely for the production of fabrics for clothing and many other purposes, and its seed as a foodstuff, used as an edible oil and ground into flour. 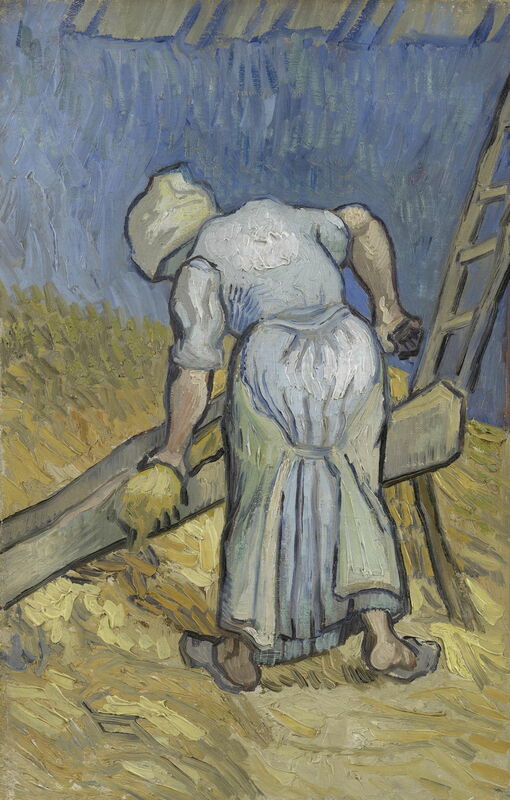 Vincent van Gogh (1853–1890), Peasant Woman Bruising Flax (after Millet) (1889), oil on canvas, Van Gogh Museum, Amsterdam. Wikimedia Commons. 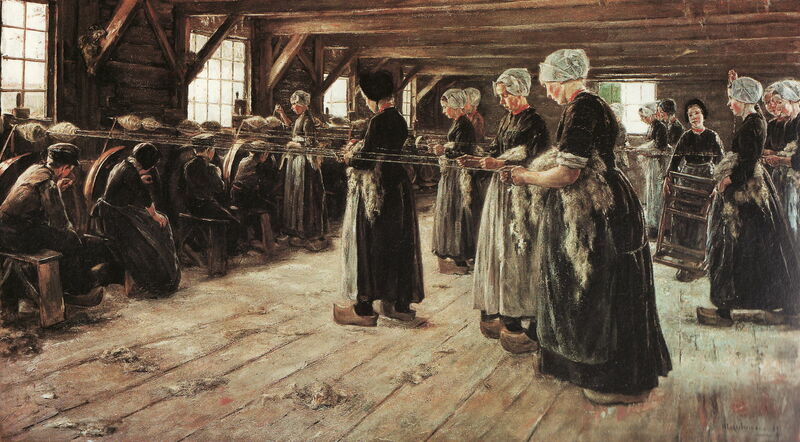 Max Liebermann (1847–1935), The Flax Barn at Laren (1880-90), oil on canvas, 135 x 232 cm, Alte Nationalgalerie, Berlin. Wikimedia Commons. The drying properties of these oils were known to the ancient Mediterranean civilisations, but they do not appear to have exploited them as paints, preferring fresco for wall-painting, temperas and encaustic painting (using wax) for panels. They had a good range of pigments, some of which faded quite quickly when exposed to light, and suitable grounds, but solvents/diluents were in very limited supply. Solvents and diluents suitable for use with oil paints are generally known as spirits, and derive from mineral sources (mineral spirits and other fractions obtained from oil deposits) or plants (turpentine from the resin of the terebinthine and other species of pine tree, lavender oils from the flowers of lavender plants, and alcohol from fermentation of sugars). Production of significant quantities requires the process of distillation. Although distillation was first used around 100-200 CE, the first clear evidence of the distillation of solvents (alcohol) appears in the 1100s, and it was during the 1200s that it probably became sufficiently well-developed for the production of useful quantities of solvents for oil painting. By about 1500, commercial quantities of suitable spirits were being traded in major centres in northern Europe. The dates of availability of solvents/diluents correspond well with the scale of adoption of oil painting in northern Europe: the earliest use of drying oil in painting was in about 1180, with a few more examples from the 1200s and 1300s, and wider use from 1400 onwards. Purification and treatment of drying oils was a technical issue which had to be overcome before they were suitable for use in painting. Crushing flax seeds produces an oil which is contaminated by substantial quantities of debris and other matter, which needs to be filtered and washed. The resulting oil then dries very slowly; although oil paints have long been preferred over (for example) egg tempera because of their much slower drying, in the cool and wet climates of northern Europe paints based on plain oil could take weeks to dry, before they could be overpainted. At some quite early stage, it was discovered that various treatments could be applied to drying oils to accelerate their drying. There is evidence of the use of pre-polymerisation (i.e. initiating the drying process before painting) by sunlight and heat, and the admixture of siccatives, which catalysed the chemical reactions involved in drying. Pre-polymerisation also had the advantage that it thickened the oil, and when pigment was ground in, resulted in a more viscous paint. Traditional paint-making then involved an assistant preparing the paints for each day’s work, by grinding pigment with the oil until the paint consisted of fine pigment particles dispersed evenly in the oil ‘binder’, using a type of pestle conventionally known as a muller, normally on a flat, smooth block. The muller and block were later made of glass, but in early workshops are likely to have been fashioned from polished hard stone. 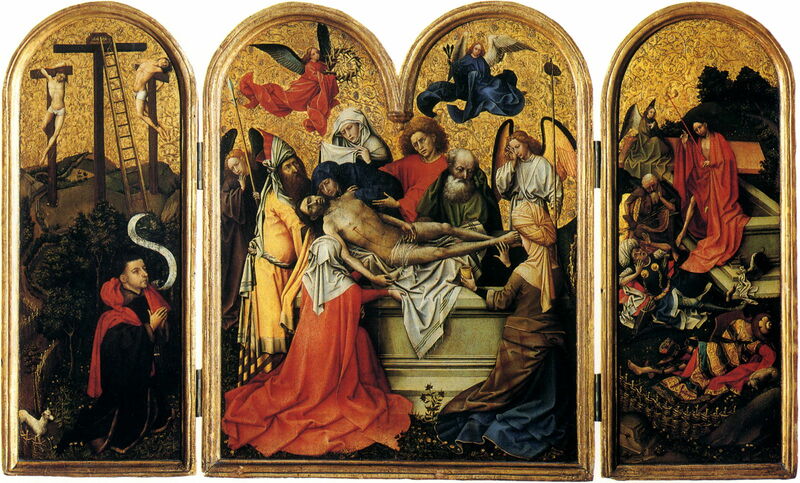 Robert Campin (1375/1379–1444), workshop of, Triptych with the Entombment of Christ (c 1410-1420), oil on panel, centre panel 60 x 48.9 cm, wings 60 x 22.5 cm, Courtauld Institute Gallery, London. Wikimedia Commons. The problem with producing such traditional paints using only drying oil and pigment is the great variation in paint viscosity and drying time, according to the pigment(s) used. As oil painting developed, artists acquired fine control over these by treating the oil (pre-polymerisation and siccatives), and adding resin thickeners. Although there was some trade in more exotic resins from southern Europe and elsewhere, the main resin found in early oil painting in northern Europe is pine resin, which was melted into the oil before mulling in pigment. Resins also have the advantage that they adjust the optical properties of the paint layer, and were discovered to enhance the ‘look’ of paintings as a result. 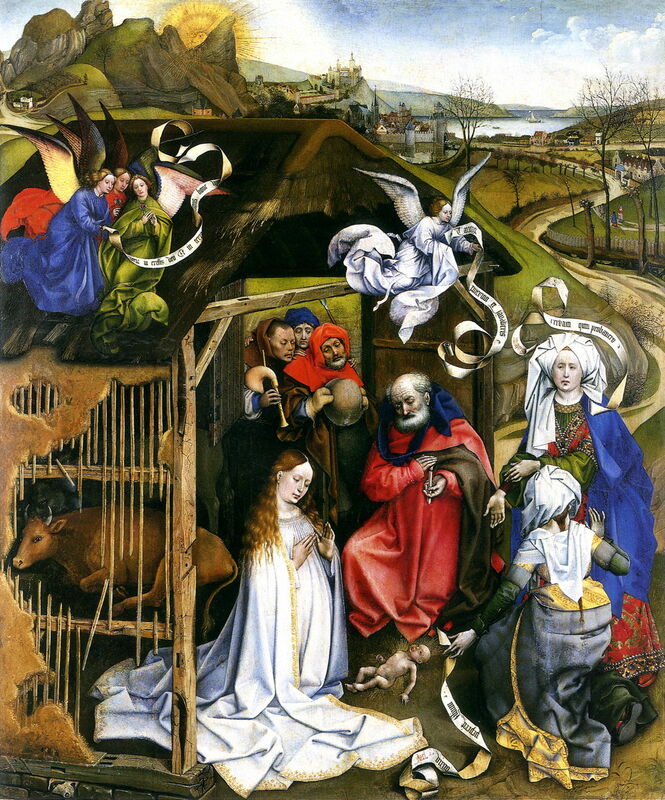 Robert Campin (1375/1379–1444), The Nativity (c 1415-1430), oil on panel, 84.1 × 69.9 cm, Musée des Beaux-Arts, Dijon, France. Wikimedia Commons. By the time that the van Eyck brothers were learning the craft of painting, early painters in oil had developed a range of recipes for the production of paints using different pigments, resulting in paints with different viscosities, and a range of drying times. 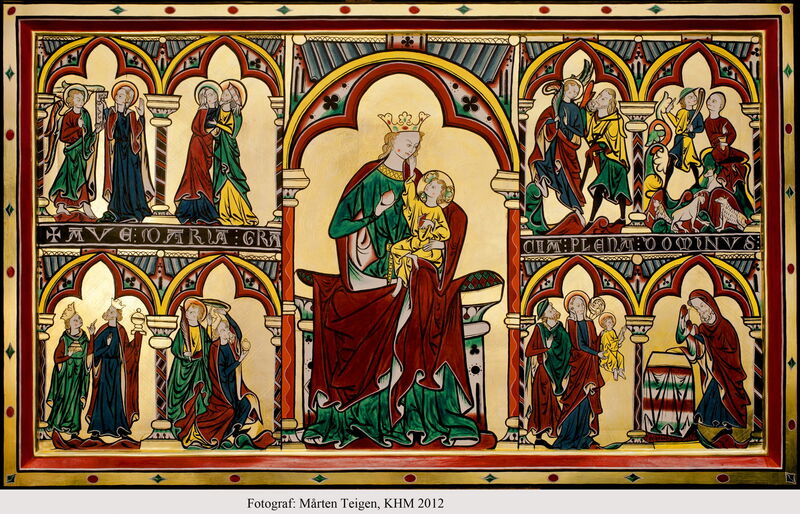 Studies of the Altar Frontal at Tingelstad by Plahter and her colleagues have demonstrated that several different formulations of binding media were used within the same painting, as early as 1300. These variations in paint formulation supported a variety of techniques, although from the earliest days most applied multiple thin layers of paint which were allowed to dry before the next was applied, rather than trying to paint areas in a single layer (as in modern alla prima technique). 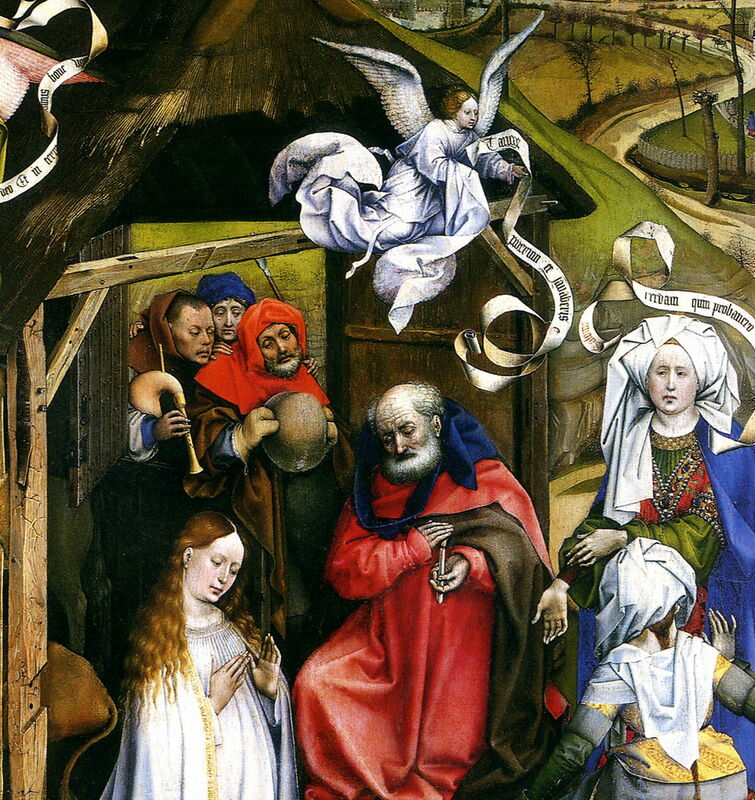 Robert Campin (1375/1379–1444), The Nativity (detail) (c 1415-1430), oil on panel, 84.1 × 69.9 cm, Musée des Beaux-Arts, Dijon, France. Wikimedia Commons. Some painters followed what is now considered by many to be the standard sequence for oil paintings of this period. A chalk ground was applied to wooden panels. Once that ground had been finished to provide a level and smooth painting surface, an underdrawing would be laid down on it using egg tempera, charcoal, or water-based paints or inks. That was then ‘sealed’ by applying a thin oil-rich layer which was often tinted with pigment, and sometimes treated with lead to accelerate its drying. 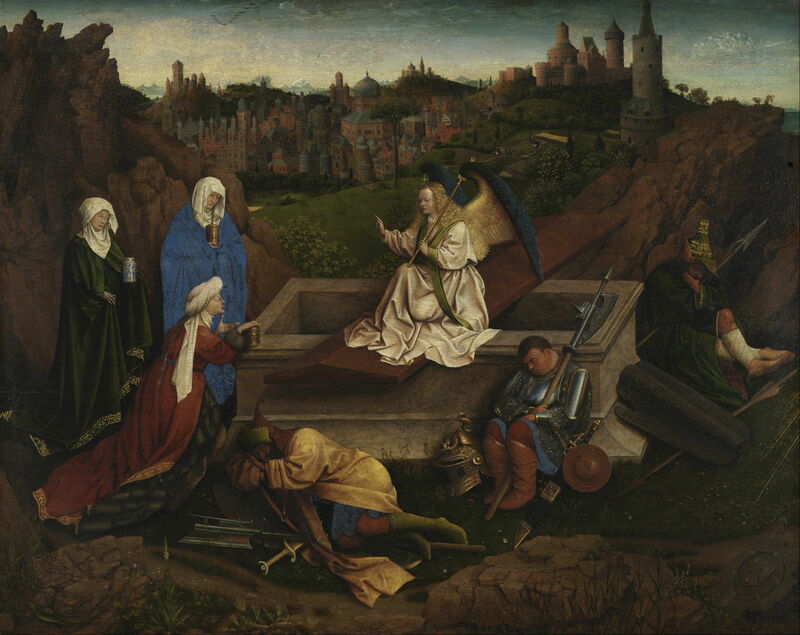 Jan van Eyck (c 1390–1441), Three Marys at the Tomb (c 1425-1441), oil on oak panel, 71.5 x 90 cm, Museum Boijmans Van Beuningen, Rotterdam, The Netherlands. Wikimedia Commons. Further layers were then applied, to model the tones and colours, some using opaque paint (possibly made more opaque by adding lead white pigment, for instance), and some transparent colour. Four or more layers were not uncommon, and gave the painter the ability to build up colour and texture in a highly controlled way. Given the very small number of oil paintings which have survived from before 1450, there is considerable variation between them, and no single ‘system’ of painting appears to predominate. Neither is there any evidence that the van Eycks ‘discovered’ any new techniques which had not been used before them. All the key techniques, including the use of thickened oils, siccatives, resins, ‘sealing’ layers, glaze layers with colour and high transparency, and so on, have all been identified in earlier oil paintings, showing that they were not ‘invented’ or introduced by the van Eycks. 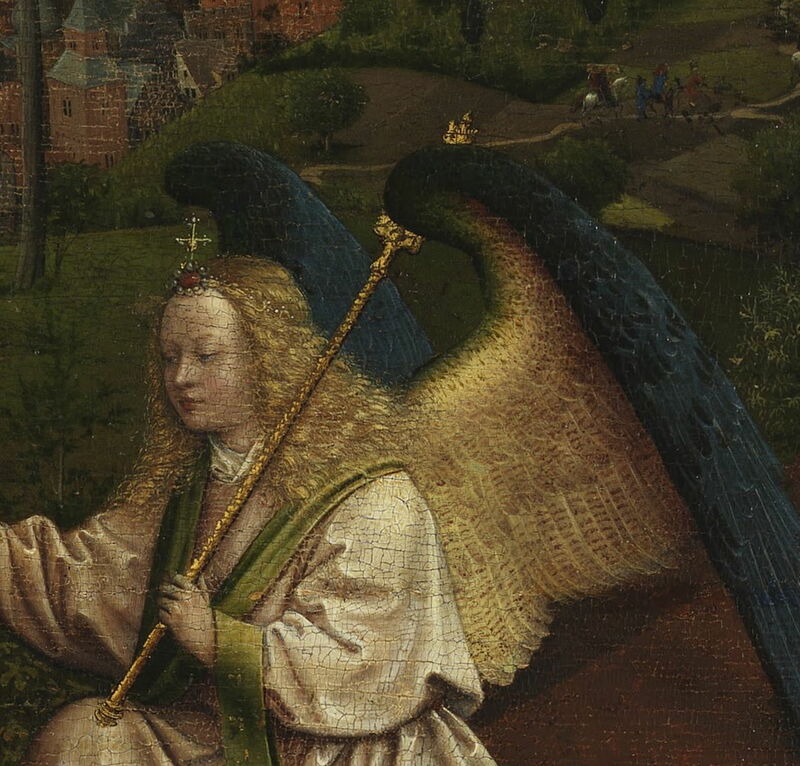 There is no evidence that the van Eyck brothers were responsible for the introduction of any radically new methods or techniques which somehow transformed their paintings. Wikipedia on the Westminster Retable, painted in oil on wood panels around 1270. Streeton NLW (2013) Perspectives on the Painting Technique of Jan van Eyck, Beyond the Ghent Altarpiece, Archetype. ISBN 978 1 9049 8270 8. Posted in General, Painting, Technology and tagged Berkos, Campin, Claus, history of painting, Liebermann, oil paint, oil painting, painting, Tingelstad, van Eyck, van Gogh. Bookmark the permalink.